Thrash-metal dropped off the radar in the UK a few years back, but in the States it's still a way of life for many. 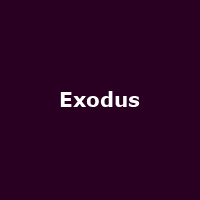 You could be forgiven for presuming that bands like Exodus had given up years ago - not so. 2010 has seen the May release of their ninth studio-set, "Exhibit B: The Human Condition", a collection of lengthy dark songs which has broken into the US album-charts, no mean feat considering their last success was back in 1992 ("Force Of Habit"). This album is a follow-up of sorts to their previous album in 2007, "The Atrocity Exhibition - Exhibit A" and features original members Gary Holt and Tom Hunting in the mix. Naturally, a tour is in the offing and Exodus return to the UK and Ireland in November, starting with Wrexham on the 18th, Glasgow (19th), Dublin (20th), Belfast (21st), Nottingham (22nd) and finally London on the 23rd. Tickets are on sale and cost from £14 (plus fees). Support on all dates is provided by Scottish tech-metal band, Man Must Die. Exodus recently hooked up with Megadeth and Testament as part of the former's 20th anniversary celebrations of the classic "Rust In Peace" reissue, further revealing the respect these boys have amongst similar thrash-rockers.